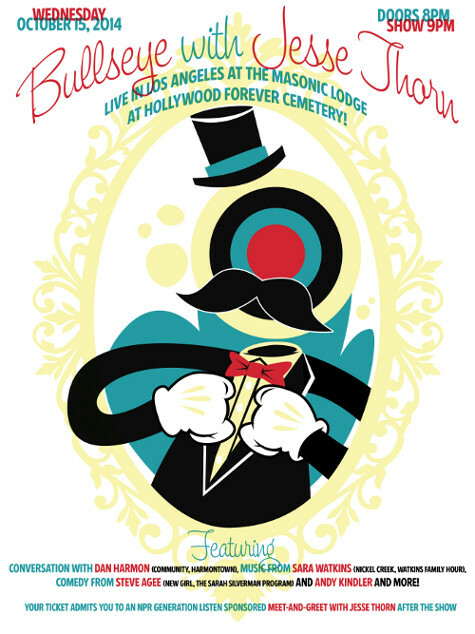 See an episode of Bullseye with Jesse Thorn LIVE at the Masonic Lodge at Hollywood Forever Cemetery! Come see an episode of NPR's arts and culture show Bullseye with host Jesse Thorn, taped live at the historic Masonic Lodge at Hollywood Forever Cemetery. Join us for an evening of stand up comedy, music, on-stage interviews and more! JUST ADDED: Rob Corddry (star of the new series Wedlock, creator and star of adult swim's Childrens Hospital)! * Your ticket gets you a free beer and admission to a NPR Generation Listen sponsored Meet-and-Greet with Jesse Thorn after the show! Our live show last fall sold out early -- buy your tickets now and make sure you don't miss out. Tickets are on sale now! Click here to purchase. To make it extra special, the show will kick off MaxFunWeek, a celebration of MaxFun podcasts and everything awesome. Mark October 15th - 21st on your calendar now and sign up for the MaxFunWeek email list to make sure you don't miss any of the fun.